Missouri senator Claire McCaskill (D.) has presented herself as a centrist who gave serious consideration to Brett Kavanaugh's nomination, but comments she made to a group of voters just after Justice Anthony Kennedy announced his retirement indicate otherwise, her Republican opponent's campaign says. In a speech to a group of supporters at a campaign office on June 29, McCaskill said a "feeling of helplessness" came upon her when she heard the news two days earlier that Kennedy was retiring, saying it "felt like a death in the family." 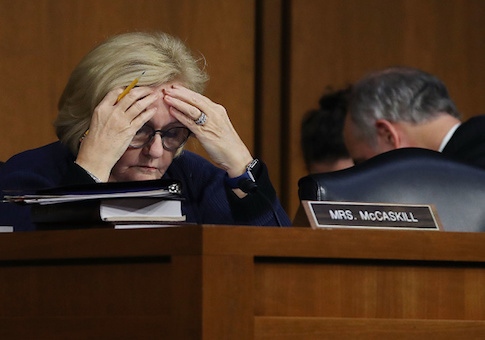 "I felt physically ill, two days ago, when I looked at the TV, and I saw that Kennedy had retired," McCaskill said in comments, which were posted to Facebook by a supporter. "It really felt like a death in the family. And a feeling of helplessness came over me." McCaskill goes on to say she hoped the news of the Supreme Court opening made it clear to voters how important it is for her to hold on to her seat, especially given the old age of the two justices "totally in sync with our values." "I can't remember how many elections … I've said, ‘This is the most important election in our lives' or ‘you know the Supreme Court really matters,'" she said. "It's like the little boy who cried wolf. I'm not sure that everybody ever really believed that, maybe they will now." "We really have to bear down and deliver the Senate for the Democratic Party," she said. "That won't happen if I don't win. I have to win for that to happen." McCaskill's emphasis on how important the Court should be to voters is inconsistent with her public comments during the nomination process. Just last week she told the New York Times she "never thought the court issue was going to be a determining factor in this election." McCaskill also had been mum on the Kavanaugh nomination, refusing even earlier this month to answer whether she'll support him. She didn't announce her opposition until September 19, saying her decision was based on his campaign finance views. Republican Josh Hawley's campaign says the June 29 comments by Hawley reveal McCaskill's mind was made up before Kavanaugh emerged as the nominee. "We always knew this was the truth, but Claire McCaskill played the press and Missourians for fools by claiming she was reviewing Judge Kavanaugh’s record," said Hawley's press secretary Kelli Ford after hearing the remarks. "But the reality is that she was going to vote no before the president even named a nominee." "Just like her friend Chuck Schumer, because for them this election is about taking back control of the Senate to block conservative judges from the bench," Ford said. McCaskill has kept her distance from the latest Democratic onslaught against Kavanaugh, even saying she "set aside" the sexual assault allegations against him when deciding how to vote on his nomination. McCaskill's campaign did not respond to a request for comment on the Hawley campaign's assertion that McCaskill would have opposed any nominee Trump picked. This entry was posted in Politics and tagged Brett Kavanaugh, Chuck Schumer, Claire McCaskill, Josh Hawley, Supreme Court. Bookmark the permalink.